I’ve been thinking a good deal lately about the way art interacts with my religion, especially when it can seem like my art is somehow getting in the way of my religious practice. Usually this is a nebulous time-management question, but sometimes there are clearcut moments: this weekend, for example, Three Cranes Grove’s vernal equinox rite will honor Indra, the Vedic god of storms, and will ask him to to send his rains to the waking earth. I’d love to attend and join in that communal ritual, but I have a conflict: I’ll be on stage with the Columbus Gay Men’s Chorus, celebrating our shared history in a 25-year retrospective show. Additionally, the final rehearsal process for that same show is taking up a good deal of my mental space and energy this week. After a full day of work and 4+ hours of evening rehearsal, I can only manage the time and energy for a brief whispered prayer before I fall asleep. And so, from one perspective, it feels like my performing life is actively distancing me from my religious life. Yet another artistic commitment, however, has reminded me of all the different ways we can honor the gods. Tomorrow I’ll be singing in a talent show to kick off a fundraising campaign at work. It took a good deal of cajoling from the organizers to get me to commit, not only because of my rehearsal schedule, but also because I couldn’t think what to sing: my repertoire doesn’t include many solo a cappella pieces, and I knew I didn’t want to sing with a tinny karaoke track. Over the past couple weeks, however, I’ve found Scottish singer-songwriter Karine Polwart’s “Follow the Heron” bouncing around my head more and more. and light lingers long by the door. in gowans that bloom on the shore. The more the song rattled between my ears, the more I realized how beautifully it expresses the burgeoning spring, the passage from winter’s cold grip to summer’s fecundity. For those listening, it should be a welcome expression of the joy we’re all feeling from the lengthening, warming days of spring, but for me it can also serve as a praise-offering to Danu, goddess of the divine waters of the earth. 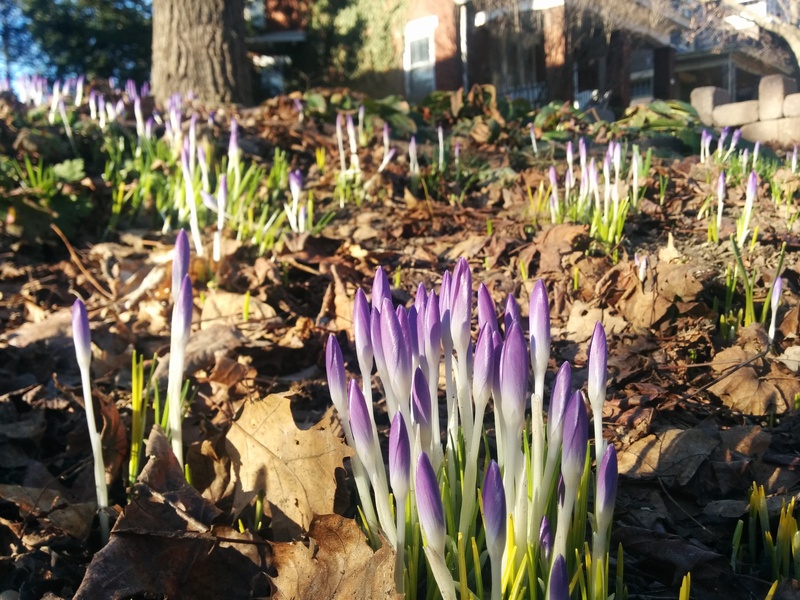 These spring flowers along my route to work shot up overnight. And once I started down that line of thinking, the divide between art and religious practice dissolved utterly. When the Chorus sings in memory of our dead: we honor our Ancestors’ memory. When we sing a hymnlike lullaby for all children, that they might “dream all the day never reaching the end / of everything possible”: we embody the protecting and blessing Matronae. When I wince at my muscles’ soreness and feel as if I simply can’t remember another piece of choreography, or the harmonies of a particularly difficult song, my struggle is tribute to Lugh, master poet and artisan, whose aid has supported me through many a performance. This is a lesson I’m still learning, and that I expect I’ll continue learning throughout my life: there is no line to draw. The Kindred are always around us, even when we don’t attend to them, and our whole lives may strengthen our bonds to them if we allow it. It’s a hard mindset to encompass, especially when it involves unlearning so many of the dualisms our culture holds true — mind/body, sacred/profane, heavenly/earthly. For this week, I’ll borrow a different part of our overculture, misquoting Augustine of Hippo: “He who sings prays twice.” So much more so, I think, if one is also dancing: I’ll pray thrice. Posted on March 18, 2015 November 6, 2015 by Mike BierschenkPosted in PrayerTagged Ancestors, art, duality, Karine Polwart, Lugh, Matronae, nonduality, song.